Vernal pools are temporary pools of water that provide habitat for distinctive plants and animals. This layer shows the locations of certified vernal pools. This datalayer contains points for all vernal pools that have been certified by the Natural Heritage and Endangered Species Program (NHESP) according to the Guidelines for the Certification of Vernal Pool Habitat (MA Division of Fisheries & Wildlife, 2009). Vernal pools are small, shallow ponds characterized by lack of fish and by periods of dryness. Vernal pool habitat is extremely important to a variety of wildlife species including some amphibians that breed exclusively in vernal pools, and other organisms such as fairy shrimp, which spend their entire life cycles confined to vernal pool habitat. Many additional wildlife species utilize vernal pools for breeding, feeding and other important functions. Certified vernal pools are protected if they fall under the jurisdiction of the Massachusetts Wetlands Protection Act Regulations (310 CMR 10.00). However, the certification of a pool only establishes that it functions biologically as a vernal pool. Certification does not determine that the pool is within a resource area protected by the Wetlands Protection Act. Certified vernal pools are also afforded protection under the state Water Quality Certification regulations (401 Program), the state Title 5 regulations, and the Forest Cutting Practices Act regulations. The Certified Vernal Pools layer is stored in ArcSDE as CVP_PT. Before 2004, Certified Vernal Pools were mapped on 1:24,000 or 1:25,000 USGS topographic quadrangle maps. The datalayer was created by NHESP by generating a Arc/Info coverage from a database of latitude and longitude points read from the USGS quads. Currently though, Certified Vernal Pools are heads-up digitized onscreen at approximately 1:25,000 scale, using Digital Globe 2011/2012 color ortho imagery as a basemap. CVP_NUM A unique identifier which may be used to identify a Certified Vernal Pool when contacting the Natural Heritage Program. “Obligate Species, Facultative Species, Fairy Shrimp”. CERTIFIED The date that the Certified Vernal Pools were certified by NHESP staff. Occurrence records of Certified Vernal Pools from the NHESP database are continually being added and modified. These updates are posted to the MassGIS data layer nightly to display any new data which has been accepted and entered into the NHESP database. Occasionally the NHESP will update the locus of already certified pools as more accurate location information becomes available. These locus edits will not update nightly but will be updated at regular intervals as necessary. Questions about the creation of this datalayer should be directed to NHESP at 508-389-6375. For questions relating to the certification of Vernal Pools, please call 508-389-6373. 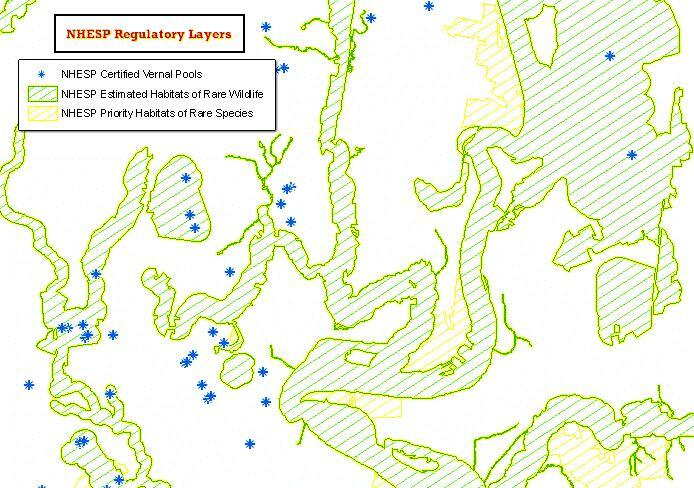 View the Certified Vernal Pools layer in an online map.